That’s the advice given by both Nathan and Wendy (Hollis) Burns, to anyone considering a farming lifestyle. Together with their four children, Nathan and Wendy are seventh generation poultry farmers in Freetown, PEI. 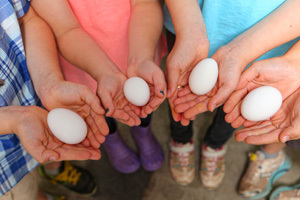 Burns Poultry Farm supplies high quality fresh eggs to Prince Edward Island and beyond. And they love it. Their advice doesn’t come at a dull time either. Finishing touches are just being done on the Burns’ new state-of-the-art barn, a fully enriched colony housing system for hens. This facility is the first of its kind in North America. The concepts and amenities in the barn adhere to the most progressive European standards for the humane treatment of egg-laying hens. “Unlike conventional housing, the new system caters to the natural instincts of the hens,” says Nathan. The hens are housed in multiple levels of spacious colonies. This allows them to socialize, flap their wings and move around. In addition to extra space, the EU standards include requirements for enrichments, such as scratching and pecking pads, privacy curtains in the nesting area, perch space and unlimited access to food and water. Another feature to allow for a more natural environment is specialized lighting that is dimmed to simulate sunrise and sunset each day. Over 13,000 birds were moved into the new system in July and according to Nathan and Wendy, they are loving it. “The morning after we moved the hens in I came out to the barn, unsure of what I might see,” says Wendy. “But the birds were perching, scratching and even laying eggs in the nest boxes! I was so excited.” The birds have been thriving ever since. With a few cosmetics left to officially complete the barn, the Burns’ renovations will permit visitors and tour groups to actually get a glimpse of the hens in their habitat. “There’s a big misconception out there, it seems that because hens are housed in a bio-secure space, which is not open to the general public, some think that poultry farmers must be doing something wrong or bad,” says Nathan about the myth. The new barn is equipped with numerous windows in the egg collection lobby, so visitors can see the happy hens for themselves. With the barn full of flourishing hens, the Burns’ are scheduled to renovate a second layer barn in January. Although this building currently exceeds Canadian regulations for hen density, Nathan and Wendy will bring the second barn in alignment with EU standards for fully enriched colony housing, like the newly renovated barn. The extensive barn renovations aren’t the only upgrades Nathan and Wendy have undertaken in their time as farm owners. They’ve renovated their federally inspected egg grading station, installed a computerized egg grader, which results in many efficiencies. They expanded production by purchasing more quota in 2006, which called for the construction of a brand-new barn. They’ve also up-graded their water treatment system. “The chickens drink better water than I do,” laughs Wendy when she talks of the filtered, softened and ozonated water the hens consume. 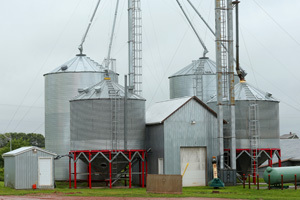 The Burns’ have also installed an on-site grain dryer and elevator, an asset to their cash crops. While it’s all been a huge investment for Nathan and Wendy, it’s completely worth it. Both growing up on farms, the concept of farming wasn’t strange to Nathan or Wendy. Nor was the idea of becoming the seventh generation of Burns to farm in Freetown. Since purchasing the farm from his parents, Donald (Class of ’62) and Lorna, in 2001, Nathan and Wendy haven’t had much time to look back and reflect. They've concentrated on growing, increasing efficiencies and adapting to the newest technology. “Farming is our lifestyle,” says Wendy. “We get to work together every day and we approach everything as a family. 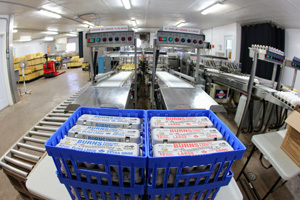 Two days per week the Burns’ grade eggs for fresh market. The kids are 'eggs'perts when it comes to grading and don’t mind pitching-in to help. Nathan and Wendy’s third child, Mitchell (nine), specializes in packing the jumbo eggs, while Kendall (10) likes packing extra-large. The girls, Mallory (12) and Shelby (seven), like to help stamp boxes and organize cartons. And all of the children love to help with the chicks! 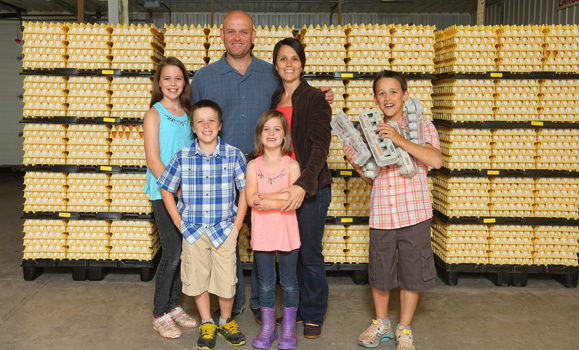 The graded eggs are picked-up by ADL Foods and distributed to Co-op stores, restaurants, retail stores and more. Burns Poultry Farm is the sole supplier of fresh eggs to ADL Foods, a partnership that speaks to the success of Nathan and Wendy. They were awarded ADL Foods Supplier of the Year for 2013. 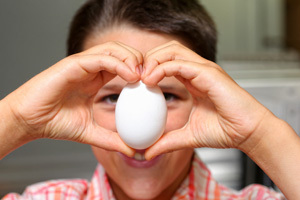 “We want to provide fresh nutritious eggs to our customers. We support local business, as they support us,” says Wendy. Impact on the community is important to Nathan and Wendy. In addition to the family helping-out, Burns Poultry Farm employs three full-time staff year round, as well as six, or more, part-time staff, to help on grading days. The majority of Nathan and Wendy’s staff are hired through Community Connections in Summerside. The non-profit organization provides employment and support services to adults with intellectual disabilities. At the end of the day, it’s no wonder Nathan and Wendy are so proud of their farm and family operation. “Do your best each day, that’s what we strive for,” she adds. The Burns’ family are doing just that.